DNA Theta Healing® is a revolutionary technique, founded by Vianna Stibal that puts together the ‘Power of thought’ and the ‘Power of Prayer’. Theta Healing® uses one’s natural intuition to connect to the realm of the Creator Of All That Is, and create healing at all levels of our being. Theta Healing® is a technique whose basis is the Unconditional Love of the Creator or God. Vianna found that by changing your brain wave cycle to include the Theta state, you can witness the Creator performing miraculous healing at every level of your being – physical, mental, emotional and spiritual. According to Vianna, every disease or disorder is held in place by a strong positive belief that supports the condition. This belief is often deep inside our subconscious mind. Therefore, the focus of Theta Healing® is to work with our belief system and remove old beliefs and replace it with new beliefs from the Creator. Very often miraculous healings have been seen when the root belief has been touched upon by the Creator’s Light. Read more about Belief Systems to know how they are so crucial to our well being. To connect to the Creator and facilitate a healing, the practitioner goes into a Theta State. Hence the name – Theta Healing®. Healing that comes from the Creator is very powerful and has the ability to change our very core. The core of our being is actually the DNA, our genetic matter. Vianna says that a lot of our beliefs are ingrained deeply into our system and held at a genetic level. Hence, this technique is called DNA Theta Healing®. The human brain has been a subject of great interest for many years now. If the brain is the central circuit-system of the body, the millions of nerves are the wires and circuits connecting the brain to the body. Nerve signals are fired and transmitted through electrical pulses between neurons. These electrical pulses in the brain are detected as wave-like patterns on an Electroencephalogram (EEG) and are called Brainwaves. The major types of brainwave frequencies known are Beta, Alpha, Theta, Delta and Gamma frequencies. Among these, Gamma waves are the most recently discovered and are still under study. What is interesting to note is that no single brainwave pattern exists independently. They coexist at all times. It is only the predominant brainwave frequency that changes from time to time, depending on our state of mind. As the brain wave frequency decreases from beta (waking state) to delta (deep sleep/trance meditation) it does not indicate a decreased activity of the brain. In fact the brain becomes more efficient in its activity in these states. The body and mind are brought to a state of deep relaxation and automatically start to repair themselves in every way. The mind is now very focused and the number of thoughts might be very minimal. In the Alpa or Theta state, a focused thought to heal a certain aspect of one’s life is extremely powerful and all the energies of the mind can be focused towards that aspect. Scientific research has shown tremendous results in experiments of this nature. The Theta state has been shown to be the state of mind when the Human Growth Hormone(HGH) is secreted at healthy levels. The body even gets into a state where changes at the genetic level can also be facilitated very easily. The Human Growth Hormone is known to have an anti-aging influence in the body, increase lean body mass and bone density in the elderly and activate a gene critical for the body's tissues to heal and regenerate (based on research by Robert Costa, professor of biochemistry and molecular genetics at the University of Illinois at Chicago and a member of the UIC Cancer Center). Thus, while the alpha, theta and delta states are all very effective at bringing the body and mind to a state of health; the Theta State is considered by many as the most conducive to produce lasting changes in the human psyche and physiology. Deoxyribonucleic acid (DNA) is the basic genetic material of our body. It is a double stranded helical molecule that has the information for all the proteins that are required in our body. The DNA is found in every cell of our body and is said to govern practically every aspect of our life. Scientists had written off a major 98% of the total DNA as “Junk” DNA. From research done so far, scientists could map practically all known features and aspects of the human body to 2% of the DNA. And they found the remaining 98% to be of no avail to the human body. And hence it was classified “Junk”. However, research continued and in more recent times, they do accept that there are many subtler aspects to the human being such as behavioral patterns under specific circumstances which could be coded in what was earlier called ‘Junk’. On the other hand, metaphysicians believe that practically every situation that a person can encounter in his life is stored in his genetic makeup. Everything that makes up a person – his energies, his tendencies, his beliefs, his habits, his limitations, his thought patterns, his emotional patterns, his past-lives, his future and much more is all coded in the DNA. And interestingly, spiritual masters and light-workers across the ages knew that the genetic code of an individual is changeable. They are all very dynamic and can be altered to attain greater potential – even abilities such as intuition, healing, teleportation and OBE. Using Theta Healing® techniques, practitioners all over the world have seen instant changes at the genetic level. The energies of the Creator have been seen to change patterns that seemed ingrained at the level of the DNA. Released family curses carried across generations. Healed genetically passed on health conditions. Helped create financial abundance in people who have always been less fortunate, and much much more. Therefore, healing directed at the Genetic Matter in an individual through Theta Healing® plays a great role in opening new avenues and clearing blocks that prevent us from experiencing our own divinity. Changing patterns at a genetic level has given rise to what is known as ‘Miraculous’ healings! An elephant, as a little cub, is chained to a post so that it does not stray away. The elephant tries hard to break free, but fails. It tries and tries until it finally believes that it is weaker than the chain and that it will never be able to break free! Eventually, the elephant grows to be really mighty. But funnily, the mahout does not bother bringing bigger chains. He continues to bind the elephant with that same old, rusty chain . In fact, there are times when he does not even chain it, he merely ties a rope to the leg of the elephant and simply lets the other end loose! But the mighty elephant is very convinced that no matter how hard it tries, it will never be able to break free. So it does not even bother trying! It believes that it is weak and stuck there. Almost every aspect of our life is governed by our beliefs. Most of our beliefs are already formed by the age of 8. And since then, we often hold onto beliefs and live our entire lives totally limited by them – just like the elephant. Perhaps it was true that it could not break free as a little cub. Perhaps the cub needed to be chained for its own protection. But as it grew, the elephant only held onto the belief ignorantly. Most beliefs might have served us in some way at a certain point in time, but as we grow, perhaps they are no longer serving us. Instead they might only be limiting us. At this juncture it is important to understand that the thoughts and emotions that affect us are not random. The beliefs that we hold actually determine the kind of thoughts/emotions we have. If we were to consider the elephant yet again, it might have felt sad/angry/depressed that it was tied to that place by its mahout. It might have cursed the mahout. The elephant might have gone through any number of thoughts and emotions about its captivity. But what is at the root of it all is the one single belief – “I can never break free!” There is always a Belief that supports every condition that we have put ourselves in. To identify a belief, just ask yourself, "Is this true for all people across cultures and languages?" If yes, then it’s a universal truth. For example, "Fire burns" is a universal truth whether we want to believe it or not. On the other hand, "I will catch a cold if I get drenched in the rain" is clearly a belief, since it is not true for everyone. And if there is even one exception to what you believe, then it is most likely a condition that you can change. The question then is, “Is this belief serving my highest good or is it holding me back?" Ask yourself if you would like to see how life unfolds when you don’t have a particular belief? Remember, what you choose to believe becomes true for you. What you do not choose to believe does not hold good in your life. The choice is entirely yours! ~ I’m not good enough. ~ I never get my way. ~ It’s not safe at night. ~ I was born to suffer. ~ Too much of anything is Bad! ~ Life is a struggle. ~ Diabetes/Hypertension is genetic and inevitable. ~ After 35 your health is bound to decline - aches, pains and illnesses. ~ No Pain No Gain. ~ You need a sound education from the IIT/IIM to be successful in life. What you choose to believe, is true in your universe! Lightworkers today have taken this a step forward and challenged even core ‘beliefs’ that have shaped our very consciousness. They have simply changed these beliefs and shown that humans are ONLY limited by what we believe. ~ Many healers and lightworkers believe that Cancer and AIDS can be healed. ~ Death itself is being challenged and lightworkers now believe that death too need not be involuntary and miserable. It can be controlled and embraced when the time is ripe. Using Vianna Stibal's DNA Theta Healing®, we have the ability to dig out these believes that are governing our lives and confront them. If the belief does not serve you, Theta Healing® can pull out and replace the belief with something that would serve you. The changes in our physiology and thinking, when we undergo a Theta Healing® session for our belief system, are immense and miraculous. Having understood the relevance of the Theta State and the role of beliefs in keeping a condition/situation in place, Theta Healing® is a gentle technique where the Energy from what we call the 'Source' of all that is, is used to make necessary changes. Vianna compares the Theta Healing® process to a tuning fork. When one tuning fork is struck, it can induce a similar frequency even in a neighbouring tuning fork. Similarly, when the practitioner gets in to the theta state, he induces a theta brainwave even in the receiver. Once the receiver has given his conscious consent, the theta healer uses his intent to channel the Creator’s energy and witness the healing done in the receiver. Watch Tara Greenway explain the Science behind the actual process. ​ThetaHealing® is a technique that focuses on thought and prayer. ThetaHealing® teaches us how to put to use our natural intuition and change our brainwave cycle to include the 'Theta' state. And once we have achieved the Theta state, to rely upon the unconditional love of the Creator-of-All-That-Is to do the actual “work”. ThetaHealing® has been designed by Vianna Stibal as a therapeutic self-help guide to develop the ability to change on all levels: physically, mentally, emotionally and spiritually using the Creator of all That Is. With growing scientific evidence that toxic emotion can contribute to disease, and the awareness that emotions, feelings and the power of thought have a direct bearing upon our physical health, there is increasing interest in changing how the mind influences the body to create optimum health. Belief and Feeling Work empower people with the ability to remove and replace negative emotions, feelings and thoughts with positive, beneficial ones. ThetaHealing® can most easily be described as an attainable miracle for your life. Do you want to know more about DNA Theta Healing® before you sign up for the healing sessions or workshops? ﻿﻿** If you register for both Basic and Advanced together, you will get a Rs.5000/- discount on the total fee for both courses. In this workshop students will learn the fundamentals of Theta Healing that focuses on activating the 12 strands of DNA within each participant. The heart of this class is the practice of techniques that allow you to change life patterns held in place by core, genetic, historic and soul beliefs, either self inflicted or externally imposed. Developing Psychic Senses and healing the Chakras. Connecting to Guardian Angels and Guides through the Creative Source. Clear unconscious memories/imprints (free floating memories) from Surgery, Abuse, War, Fainting Spells, Trauma or other traumatic experiences. This class brings with it a more comprehensive look at the topics covered in the Basic course and a deeper understanding of the Seven Planes of Existence. The student will learn how to clear old resentments, rejections and regrets; vows and commitments that hold them back. There are some deeply healing exercises that teach the student how to heal the 'Baby in the Womb' and how to heal a Broken Soul. This class is a delightful experience as students are filled with many new and positive feelings such as knowing how to live in the now and how to look at themselves and their world the way the Creator looks at all. Another highlight of this class is the tremendous amount of personal healing that the student receives. Vianna Stibal believes that unless the student is not taught to raise his/her consciousness to a certain level, healing others can become burdensome. This healing is provided to the student in the form of 'Energy Downloads' that comprise empowering beliefs, feelings and intuitive insights that can change your life forever. How to access the energy of the Source of all creation to make changes instantly. Receive hundreds of Belief and feeling "Downloads" that will profoundly improve every aspect of your life. Change old beliefs that do not serve your highest good. Advanced tips, tricks, and techniques for improving your intuitive-reading and alternative healing ability. Open up to your psychic abilities. How to get to the core of the issue and heal. Contact and communicate with your family ancestors and departed loved ones. Advanced understanding of the Seven Planes of existence and how to use them in healing and manifestation. Heal the broken heart and broken soul. Ask the Laws to help you. Eg: Bend the Law of Time to make time move faster or slower. Release Fears, Rejections, Resentments and Regrets. Send love to baby in the Womb. Connect and communicate to the Higher Self. How to program your home, furniture, vehicles and other objects to serve you better. Practice 'digging' for core beliefs. I especially loved all the downloads and the practical sessions. It is a course that really empowered me to take charge of my own healing. I loved the fact that Sushmita was very open to listening to us non-judgmentally. She was very focused on practicals. The demos were great. Thank you Sushmita for an awesome Theta Healing workshop! The Theta Healing course taught me how to be honest with myself and to be honest about what I feel. It is also really amazing to connect to the Creator. It also helped me improve my focus. And the easy way to change beliefs is nice. I loved how Sushmita created a space where everyone felt loved and wanted. It was non-judgmental. She was so pleasant and cheerful throughout the workshop.Her experience as a healer really comes through when she teaches the course. The concepts were quite well explained. 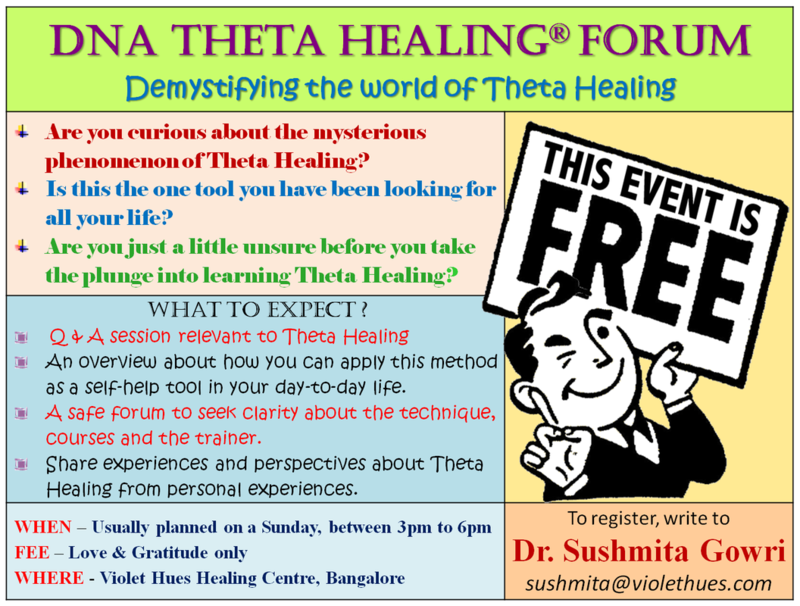 And I thoroughly enjoyed learning Theta Healing with Sushmita. The best thing about the Theta Healing course is that it taught me how to connect with the Creator and to know that I have the power to heal myself and others. Sushmita made things very simple, direct and come to my level (beginner) and explained the techniques. Everything was perfect and wonderful. Firstly, thank you - just as much as the Theta Healing course opened up new thoughts, it was just so good and comforting to be in Sushmita's presence and Natesh's too. Thank you both for the warmth you exude. I also feel a little more equipped about dealing with everyday issues at work etc. The energy of the group was fantastic. There was so much we could learn from each other. I liked how Sushmita used anecdotes (sometimes from her own life) to explain something. It made the idea much more accessible for us. I totally admire the way Sushmita said "I don't know. I will check it up", instead of brushing aside some of our doubts. Most importantly I loved how much Sushmita believed in Theta Healing and in the Creator herself. There was a lot of conviction when she spoke. Everything about the Theta Healing course was amazing. Sushmita is a wonderful teacher with high and active energy and spirit. I was pampered with her wisdom. I came with no expectation but leaving with a lot of knowledge. I enjoyed the Basic Theta Healing course all through and am looking forward to the advanced course later. I find Theta Healing a rare course which comes under the category of treating people at the Causal Level. It heals from the highest level to the micro level (DNA). A very nice way of handling issues of our own day to day life. I found Dr.Sushmita very friendly and passionate to teach Theta Healing, and has a lot of patience for everyone to understand the process. She is very accommodating to all queries and paced the sessions very well to the needs of the class. I found the session very interesting and informative. I liked the realistic approach in the session from a healing perspective with more focus on resolving the client's issues using Theta Healing. I liked the rapport Sushmita built with students attentive and responsive to doubts and concerns. I personally feel there should be more practice, especially for those who are new to any type of healing, meditation or energy work. I would definitely recommend this course to anyone interested in healing. It works wonders. I also recommend Sushmita as an instructor for her passion in the work and her involvement is inspiring. Lucky to have a teacher having great zeal to teach beyond books becoming a student also at times. Theta Healing is really a new and great healing therapy. I liked many things about the Theta Healing course, but to keep it brief, I liked Sushmita's way of explaining and her way of observing and letting us become master of our life makes me like the course. I will try to my last blood drop to take this to other people to the maximum level and even become a teacher of this course myself. The best thing I like about this course is 'Connecting to the Creator'. It gave me immense confidence, peace and calm to know that I am a part of the Creator and no different from him and seek his help at any point of time in my life. About the trainer, Dear Sushmita, I just wanna say one thing "My class wouldn't have got any better if it was not you." The enthusiasm and passion you have as a teacher is what reflected in us. You made difficult topics very simple and literally spoon fed us. thank you so much for that. I would NOT recommend this course to anyone 'cause I strongly believe that a person can learn/get to learn something like this only when the 'Right time' comes. But would definitely recommend you if anyone is really serious to grow in this field. I am looking forward to grow in Theta Healing and I wanna give you a disclaimer that at any point in time if I am stuck with something, YOU are the first person I am gonna disturb for help! Sushmita is a very pleasant person with a warm attitude and persona. She wishes to share her experiential learnings and chooses to help in every which way. Sushmita really took us through the Theta Healing course so well. The Digging sessions were fantastic. Par excellence! Theta Healing helps us to see life in a different way. And for sure this modality is a life changing one. I thoroughly enjoyed it. Sushmita is amazing. The energy and kindness that she showed on all 3 days was rally fantastic. And the interest she showed to clear every single doubt is really brilliant. The entire course was beautiful. I am blessed to be a part of it. Thank you so much. Theta Healing course is really awesome. Everything helps you to lead your life in the highest and best way. Sushmita is highly energetic and enthusiastic. She spent so much time on practicals than the theory, which helped me a lot. And I was very glad Sushmita took complete accountability on making sure everyone takes home whatever she wanted to teach. Overall I feel the content is too vast to cover in 3 days. Perhaps more time can be given to cover the course. Maybe 4 days. I had heard a lot about Theta Healing from many people and wanted to do the course. I was searching for a good instructor and found Sushmita when I googled about this. Even before meeting her, a mail sent by her made me feel that she is an awesome person. The best part in her class is that she never puts her beliefs and opinions on us. Whatever she says is from Creator's perspective. Whenever she is not sure she first does not say anything, but says "I will have to check with the Creator." So you can be sure that after clearing old beliefs you won't be getting new unwanted beliefs. Theta Healing has empowered me, calmed me, reduced desperation and has made me feel really good and light. Thank you Vianna, Thank you Sushmita and Thank you Creator.